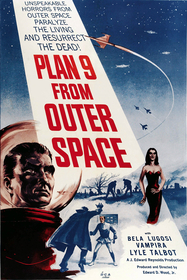 Plan 9 from Outer Space flies in the face of all conventional wisdom. How can a film this incompetently produced feel so good? Edward D. Wood, Jr. gives the world another truly great bad cinematic experience and it must be celebrated. Flying saucers over Hollywood! People in panic! Yes, dear friends, aliens have rather indiscreetly shown themselves to the public, and they're fighting mad. Humanity is filled with morons and that makes Earth dangerous. In order to stop us from developing sun-exploding superweapons, the aliens reanimate three corpses as part of their ninth plan. The genius of the film lays mainly in the script. The plot itself is convoluted and ridiculous, but it's the dialogue that tickles the ear. People mangle adverbs, dodge specifics, and raise the bar for obvious statements. There's dozens of gems to choose from, but my favorite is still "You see? You see? You're stupid minds! Stupid! Stupid!" Low production values also enhance Plan 9's enjoyability. An airplane cockpit is nothing more than a couple of chairs and a curtained doorway. Gravestones get knocked about like the cardboard they really are. Stock footage is liberally applied everywhere. Plan 9 is a bit too ambitious in its scope for its meager budget, and it really shows. The Ed Wood Irregulars compose the majority of the cast. Tor Johnson essays the role of a lumbering brute with all the panache of his other lumbering brutes. Tom Keene and Duke Moore capture the manly bluster of Woodian heroes. Vampira (as Ghoul Woman) and Criswell (who introduces and narrates the film) make fine additions to the troupe. Sadly, this is the last film appearance of horror legend Bela Lugosi. The footage wasn't even shot for Plan 9. It was for another project that fell through with Bela's death. Wood cobbled the scraps of film together and tried to construct a plotline out of the silent footage (most of which was simply Bela stalking around in his Dracula duds). The rest of his part was portrayed by Tom Mason, a chiropractor of greater height. Mason's resemblance to Lugosi apparently ends just below the eyes, as he spends the movie with the bottom half of his face covered by a cape. Shockingly, Wood's actual direction is fairly competent. It's no worse than a dozen other contemporary science fiction films, anyway. Wood pushes in with the camera for dramatic moments and usually keeps his subjects well-framed. There are a few weird, unnecessary moments, but otherwise the pacing is solid. 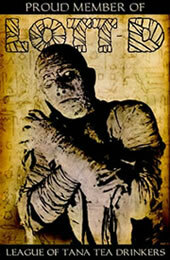 Fans of "Mystery Science Theater 3000" know what to with a film such as this: heckle. I myself have developed a regular routine of catchphrases and snarky commentary that I shout out when watching. Gather a bunch of friends together, pop Plan 9 in, and have a lot of fun. You won't regret it.